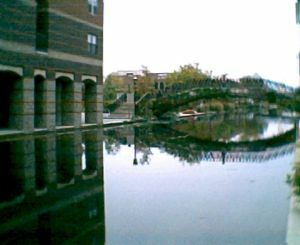 The reflection of a bridge in Indianapolis, Indiana's Central Canal. Spheres reflecting the floor and each other. Reflection is the change in direction of a wave front at an interface between two dissimilar media so that the wave front returns into the medium from which it originated. Common examples include the reflection of light, sound, and water waves. The phenomenon of reflection is extremely valuable for our daily lives. For instance, the reflection of visible light allows us to see objects that do not produce their own light. The reflection of microwaves is useful for radar scanners. The reflection of sound waves in a theater or concert hall enlivens an onstage production. The reflection of seismic waves allows researchers to study the Earth's structure and to prospect for petroleum and other natural resources. The reflection of visible light is also often used for aesthetic purposes. Reflection of light may be specular (that is, mirror-like) or diffuse (that is, not retaining the image, only the energy) depending on the nature of the interface. Whether the interfaces consist of dielectric-conductor or dielectric-dielectric, the phase of the reflected wave may or may not be inverted. A mirror, consisting of a glass sheet in front of a metallic coating, provides the fundamental model for specular light reflection. (Most of the reflection occurs from the surface of the metallic coating.) Reflection is enhanced in metals by suppression of wave propagation beyond their skin depths. It is also possible for reflection to occur from the surface of transparent media, such as water or glass. In fact, reflection of light may occur whenever light travels from a medium of a given refractive index into a medium with a different refractive index. 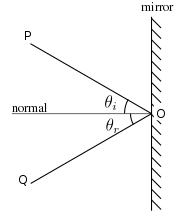 In the most general case, a certain fraction of the light is reflected from the interface, and the remainder is refracted. Solving Maxwell's equations for a light ray striking a boundary allows the derivation of the Fresnel equations, which can be used to predict how much of the light is reflected, and how much is refracted in a given situation. Total internal reflection of light from a denser medium occurs if the angle of incidence is above the critical angle (minimum angle of incidence at which total internal reflection occurs). When light reflects off a material denser (with higher refractive index) than the external medium, it undergoes a 180° phase reversal. By contrast, a less dense, lower refractive index material will reflect light in phase. This is an important principle in the field of thin-film optics. When light strikes a rough or granular surface, it bounces off in all directions due to the microscopic irregularities of the interface. Thus, an image is not formed. This is called diffuse reflection. The exact form of the reflection depends on the structure of the surface. Some surfaces exhibit retroreflection. The structure of these surfaces is such that light is returned in the direction from which it came. A simple retroreflector can be made by placing three ordinary mirrors mutually perpendicular to one another (a corner reflector). The image produced is the inverse of one produced by a single mirror. A surface can be made partially retroreflective by depositing a layer of tiny refractive spheres on it or by creating small pyramid like structures (cube corner reflection). In both cases, internal reflection causes the light to be reflected back to where it originated. This is used to make traffic signs and automobile license plates reflect light mostly back in the direction from which it came. In this application, perfect retroreflection is not desired since the light would then be directed back into the headlights of an oncoming car rather than to the driver's eyes. Some materials, such as beryllium, can reflect neutrons. They are used in nuclear reactors and nuclear weapons. When a longitudinal sound wave strikes a flat surface, sound is reflected in a coherent manner provided that the dimension of the reflective surface is large compared to the wavelength of the sound. Note that sound has a very wide frequency range (from 20 to about 17,000 Hz), and thus a very wide range of wavelengths (from about 20 mm to 17 m). As a result, the overall nature of the reflection varies according to the texture and structure of the surface. For example, porous materials will absorb some energy, and rough materials (where rough is relative to the wavelength) tend to reflect in many directions—to scatter the energy, rather than to reflect it coherently. This leads into the field of architectural acoustics, because the nature of these reflections is critical to the auditory feel of a space. In the theory of exterior noise mitigation, reflective surface size mildly detracts from the concept of a noise barrier by reflecting some of the sound into the opposite direction. All interactions between light photons and matter are described as a series of absorption and emission of photons. If one examines a single molecule at the surface of a material, an arriving photon will be absorbed and almost immediately reemitted. The ‘new’ photon may be emitted in any direction, thus causing diffuse reflection. The specular reflection (following Hero's equi-angular reflection law) is a quantum mechanical effect explained as the sum of the most likely paths the photons will have taken. Light-matter interaction is a topic in quantum electrodynamics, and is described in detail by Richard Feynman in his book QED: The Strange Theory of Light and Matter. As the photon absorbed by the molecule may match energetic levels of the molecule (kinetic, rotational, electronic, or vibrational), the photon may not be reemitted or alternatively may lose some of its energy in the process. The emitted photon will have a slightly different level of energy. These effects are known as Raman, Brillouin, and Compton scattering. ↑ The refractive index of a medium (through which light is traveling) is the ratio of the speed of light in a vacuum to the speed of light in that medium. ACEPT W3 Group. 1999. The Reflection of Light. Dept. of Physics and Astronomy, Arizona State Univ. Retrieved February 10, 2007. Fishbane, Paul M., Stephen Gasiorowicz, and Stephen T. Thornton. 2005. Physics for Scientists and Engineers. 3rd ed. Vol. 2. Upper Saddle River, NJ: Prentice Hall. ISBN 0131418815. Henderson, Tom. 2004. Reflection and the Ray Model of Light. The Physics Classroom. Retrieved February 10, 2007. This page was last modified on 2 April 2008, at 15:15.